Several years ago, the builders of the popular Camano 31 began thinking about launching a larger yacht. 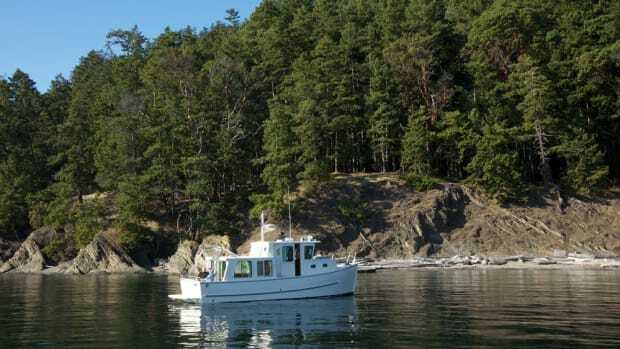 Before jumping into that costly and complex venture, however, Brad and Jaslyn Miller, owners of British Columbia-based Camano Marine Ventures, decided to ask boaters what they wanted. They interviewed faithful Camano owners—some of whom were clamoring for a big Camano—and other people who boat, but not on a Camano. The Millers asked how they cruised, how they spent their time, and what they would do differently on a boat of about 40 feet. The results were mildly surprising. While many members of the Camano family are experienced boaters and cruise extensively on both coasts, the Millers learned that a typical cruising day seldom exceeds four hours. “People got out their log books and analyzed their operating patterns, and we learned that they ran the boat less than 10 percent of the time they were aboard,” Miller says. The boaters interviewed emphasized that they liked to cruise without guests or family—most of the time—but that they were comfortable traveling with friends aboard another boat. “So, early on, we decided not to force a second stateroom into the boat,” Miller explains. “We asked, ‘How could we make a boat more appealing, particularly for a woman who may not be as enthusiastic about boating as her husband?’” Miller adds. The response—boaters wanted a comfortable, homelike boat for the hours they are at anchor or at an out-of-the-way moorage. Those questions, and the answers, began to shape the boat that would become the 41 Camano. Studying the responses carefully, the Millers decided against a pilothouse-style yacht, even though they are hot items on today’s boating market. Instead—hoping to provide a maximum amount of living space—they chose sedan styling, with a flush deck. As they began detailed work, they approached the boat as if it were a cottage or a second home and certainly not a knockabout for guys going fishing. One challenge was to provide this space and comfort in the envelope provided by the Camano shape. They weren’t going to mess with that proven design, in production since 1989. An added task was to provide a comfortable yacht without diminishing its seagoing qualities. After countless difficult hours of debate, planning, and working with professional designers—the Bristol Harbor Group, a naval architectural and marine engineering firm in Bristol, Rhode Island, and some nonprofessional second-guessers (more about this later)—and surveying market potential, they came to a decision. Yes, they would build a 41-foot Camano. Their goal was to introduce the new yacht at boat shows in the fall of 2005. Their first major disappointment came when a subcontractor building the hull molds missed deadlines, and they realized the 41 debut would be much later. The Millers decided not to rush production; they didn’t want to show a boat that was not finished or not quite right. The first boat was almost a prototype. Craftspeople built and installed components. But the Millers, dissatisfied, had them torn out and redone, only better. In January of this year, the boat met Camano standards for performance and finish. Finally, she was ready to move out. Brad Miller motored away from his factory moorage near Richmond, British Columbia, down the Fraser River into Georgia Strait and into Vancouver for a winter boat show. The 41 shows all signs of success. As this was written, Camano had orders for 11 boats, with four of them under construction. My turn aboard the new 41 Camano came a few days after the Vancouver show. I found the yacht, and the Millers, at her moorage in Coal Harbour, an exciting city-center bit of Canadian waterfront. The builders had never teased us about what the new boat would look like. From the beginning, we knew it would retain the styling of the original Camano. Walking toward her on the dock, it only took a second to realize this was not just a pumped-up 31. Yet its genesis clearly was the 31. “We took hull lines from the 31 and gave them to the Bristol Harbor Group. We gave them weights and operating specs and said it should be capable of all-day cruising at 14 knots,” Miller explains. Like the 31, the 41 has trademark Camano windows all around. But the big sister has windows with rounded corners, a change that measurably updates and improves her general appearance—at least to my eye. The design effort with Bristol subtly has produced a smoother, more sophisticated looking Camano. 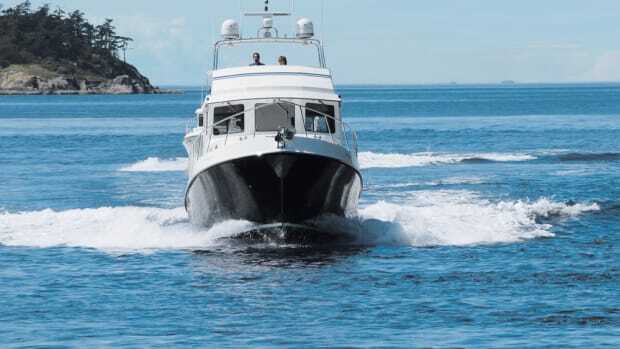 The 41 still has the rounded, workboat transom styling of the original design and its gentle sheerline, with just a hint of a break near the helm. She still is built on the Camano Keelform hull, which blends a hard-chined, planing bottom aft with the deep stem and big keel normally found on slower displacement yachts. The blend permits good handling and stable cruising at speeds from 8 knots to 17. Boarding is via a transom gate. The cockpit is 6 feet deep and leads to side decks, a stairway to the flybridge, and a powder-coated aluminum door into the saloon. Let’s first look for the promised creature comforts. On the starboard side of the saloon are an adjustable table and an Ultraleather-upholstered couch by Flexsteel—a century-old Iowa furniture company that now is focusing sharply on the marine and RV market—and not the fixed bench seat or settee found on many boats. The couch is convertible, with an air mattress inside, for those rare occasions when the owners have overnight guests. The advantage of a settee is the generous storage space often found beneath, a place to conceal wiring, hoses, and heating units. There is no storage beneath a couch. It’s a trade-off, just one of the boating design compromises we all know so well. On the opposite side of the saloon, Camano installed two matching Flexsteel casual swivel chairs—again, with reading lights. The upper side walls and overhead are covered with Ultrasuede fabric. The saloon sole is mahogany, with planks laid end to end, the way flooring is installed in homes. It is a stylish and refreshing feature found only on a few new boats today. Area rugs add color to the rich tones of the wood. The galley is forward on the port side. It has counters topped with man-made stone, big drawers for storage of pots and pans and other kitchen gear, a double sink, three-burner propane stove, and a stacked 12-volt Nova Kool refrigerator/freezer. The counter is large enough for two chefs to work, or for two to eat side by side. Boaters who spend their weekend at the dock and dine on paper may not crave such a spacious galley, but serious cruisers likely will. All drawers are on glides and easy to open, and they latch tightly with push-button locks. There is additional storage on the starboard side, beneath and adjoining the helm seat. Controls for the 6kW Northern Lights generator, FCI Aquamiser watermaker, and a 2.8kW Pure Sine Wave inverter are in the galley—a convenient location. Six of the saloon windows open and have screens—and in the Camano’s Northwest home, that’s all the air conditioning that’s needed. The 41 has two Espar C4 forced-air furnaces: One warms the saloon generally in daytime, while the second provides heat for the stateroom, head, and galley for nighttime comfort. For boats cruising in hot and humid areas, Camano will install air conditioning. The overhead has rows of 10-watt halogen lamps. The Camano lighting system is zoned, and dimmers are on most circuits. Saloon lights can be controlled from switches at the entry door, or forward near the helm. Users can turn on a few lights, or all. “Someone can be working in the galley, with the lights on bright, while others can be watching a DVD in the saloon with lights dimmed,” Miller says. Not a part of the comfort package, but critically important, is the ceiling-mounted grabrail that runs the full length of the saloon. The helm is to starboard. The demo boat has a single helm seat, but Camano will install a double, with a warning that it takes up much space. A stool in the galley would be better for another person on watch and also could be used for meals at the counter. The view is unobstructed from the galley (no overhead cabinets), and there’s space to spread paper charts. Immediately aft of the helm seat is a multipurpose cabinet area; on this boat, the microwave oven occupied one niche, while the rest was devoted to storage, a desk (which could be enclosed as a cabinet), and a shelf area for a flat-screen TV. Camano uses mahogany for interior finish and cabinetry. But Miller explains that Honduran mahogany now is almost impossible to buy, and Camano is turning to the use of sapele, a hardwood commonly called African mahogany. On the demo boat, sapele is used only for window valances. The wood is similar to mahogany, but has more gold-toned highlights. Interior finish is not ornate or elaborate on Camanos, but it is skillfully done with good materials. The craftspeople at Camano who cut, shape, and finish wood do their jobs well. And, while discussing quality, the same aptitude is evident in fiberglass molding and finishing. Fiberglass work looks flawless. Camano buyers will select an electronics package as part of commissioning. Miller installed a Furuno NavNet system on the demonstration boat and a pair of 12-1/2-inch monitors—for plotter, radar, depth sounder, and other information displays—directly ahead of the helm where they are easy to see. 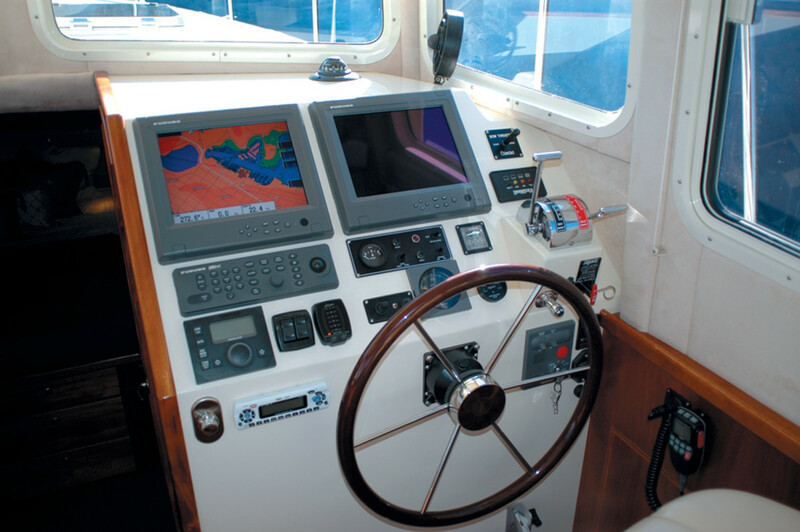 Less critical controls—the Simrad AP25 autopilot and trim tabs, the tachometer, and engine gauges—are arrayed below the monitors. They are in sight, but not obtrusive. This is the way helm instruments should be arranged. Matching navigation gear was installed at the flybridge helm. Thanks to the many windows, the lower helm has an excellent all-around view. There is no door to the side deck at the helm. The basic design of the boat—with the interior sole well below the outside deck—makes a helm door impossible to install. This forces the helmsman to scoot through the aft door to help with landings. A centerline stairway leads down three steps to the head and master stateroom. On many boats with staterooms in the bow, there’s insufficient space for a proper bed, and owners wind up sleeping in undersized, coffin-shaped beds. Having been there, I can testify they are not particularly comfortable. The Camano 41 has a true queen-size, 60-by-80-inch innerspring mattress—the kind you buy in home-furnishings stores. After a long day of boating adventures, it should be a delight. Just like home. Camano split the head. The marine toilet and a washbasin are to starboard, and a wet shower, washbasin, and a dry storage cabinet are on the port side. The wet shower is the place to hang foul-weather gear for drying. Stateroom storage is generous. There are six long drawers beneath the berth, tilt-out cabinets for storage of linens and laundry, a two-rod hanging locker and a cabinet on the aft bulkhead that contains storage, and a combo washer/dryer. Two screened hatches/skylights are in the overhead. Zoned halogen lights are overhead, and reading lights are above the berth. Judging by Camano’s flood of early orders, the 41 satisfies the need for a comfy boat. I walked aft through the galley and saloon and stepped through the single-width, centerline door for a better look outside. The bridge deck extends over the cockpit, offering weather protection while working or relaxing. The overhead has no supporting structure in the cockpit; it is cantilevered on beams extending forward into the deckhouse. The exterior of the 41 is fiberglass, stainless steel, and powder-coated aluminum (the door and window trim). There is no wood to worry about. The deck surface is textured fiberglass. In the cockpit, we unlocked and popped open the lazarette hatch cover. It rose easily on gas struts, and a short ladder reached below deck. The fiberglass box stringers that run the length of the hull were exposed, and the spaces between them should be good for storage. Deck gear placed between the stringers should stay put in rolling seas. The steering quadrant is fronted by a clear plastic panel that will keep crew and gear from falling into the steering mechanism. A slender, 4-foot-long black box suspended just below the deck on the starboard side of the lazarette houses a boarding ladder manufactured by Garelick Marine. If someone winds up in the water, he or she can open the storage box from a fitting low on the starboard quarter and pull the ladder out; three sets of steps automatically extend from the ladder’s centerpiece. With the crew member safely aboard, the ladder is raised and pushed back into its watertight storage box, with the steps folding along the length of the centerpiece. Storage lockers in the cockpit contain a fire extinguisher, propane tanks, and the shorepower outlet with space for storage of about 35 feet of cable. It has fresh and seawater washdown taps and a handheld shower offering hot and cold fresh water. Fire extinguishers are mounted in niches throughout the boat. They are instantly accessible but out of the way at the same time. You won’t bump them while walking by. A stairway with good hand grips leads to the flybridge, which has a full helm, a pilot’s seat, and a seating area for guests. Aft of the helm is a large open space, which could be used for dinghy storage. It also has potential for just relaxing, with space for lounges and perhaps a refrigerator and barbecue. The bridge is fully enclosed by stainless steel railings, making it safe for entertainment and a fine place to spend an afternoon at anchor. Miller mounted his inflatable dinghy on the swim platform, using a SeaWise hydraulic lifting system powered by a 12VDC motor. Its cost is roughly similar to the price of a dinghy hoist on the upper deck, and Miller believes it’s more convenient than working from a launch pad on the flybridge. Every engine manufacturer is struggling with changes needed to meet U.S. and international air-quality standards. Old, favorite engines are gone; new engines with full electronic controls are coming. Camano faces the same issues. The demonstration boat is powered by a single 500hp mechanically controlled Yanmar. Beginning with the fifth hull, Camano will install the all-electronic Yanmar 6LY3A-STP—a four-stroke, 24-valve, 440hp engine that meets air-quality standards imposed by the United States and the European Union. It should be quieter, cleaner, and more efficient. However, the Camano truly lived up to its reputation as a boat that works well at any speed. She was a charm to handle at displacement speed, about 8.8 knots. There was little engine noise, and she was responsive. Other “sweet” spots I found were at 10 knots and a little above 12. Again, the 41 behaved beautifully, answering the helm quickly and holding a steady course. Camano’s work on sound control keeps the noise level at 12–14 knots at 73–74dBA. Normal conversation is possible. At 8–10 knots, Miller believes the boat will be gentle on the fuel budget—averaging, he hopes, about 2 miles per gallon. A Yanmar-developed fuel consumption graph suggests that at speeds in the teens, the new engine will use about 1 gallon of fuel per mile. But nothing will be certain until a boat with that engine goes cruising. The blend of displacement and planing hull designs produces interesting results at sea. With nothing worse than a 2-foot ferry wake, the 41 was rock solid under way because the heavy molded keel provides stability while the flat bottom discourages rolling. I jammed the throttle to the stop and made hard turns as we cruised at 16 knots. The 41 pulled a tight circle without heeling. Starting from a stop and going instantly to wide-open throttle, the 41 picked up speed quickly. The bow rose sharply, but a couple of clicks on the trim tab control brought it back down. Camano’s goal was a boat that will run all day at 14 knots. Clearly, she will do that easily. But for an enjoyable, quieter, and more economical trip, I think something like 10 knots will be a winner. I’d save the horsepower for running rapids after slack or getting home before a storm hits. Vancouver’s harbor is a stunning setting for testing a boat. High-rise buildings crowd one shore, with snowy mountains on the other. Although it was a winter day, the sea was calm. If we’d had the groceries and time, I would have voted to head north to Princess Louisa Inlet, a harbor surrounded by mountains that should be on any boater’s top-10 list of favorite places. But that would take three days, and we had only an afternoon. Three hatches in the saloon sole open to the engine room. I fear hatches like these because they often are heavy and can fall if the boat moves. But Camano uses hinges and gas struts to make opening the hatch covers easy and safe. Miller demonstrated the simplest way into the engine room: Sit down, drop the legs over the edge, and slide down. The Yanmar diesel sits low in the engine room, partly into the hollow keel. Much other equipment is there, too—the generator, inverter, two furnaces, the VacuFlush system and holding tank, two banks of batteries, fuel-polishing gear, and oil-changing equipment. Despite that, there is no sense of crowding, although it is a hands-and-knees or seat-of-the-pants space. The forward hatch opens at the front of the engine. The middle hatch exposes the main body of the Yanmar, and the aft hatch reveals the ZF reduction gear and the Northern Lights generator. Camano installed Marelon through-hull fixtures. (Marelon is a fiberglass-reinforced plastic approved for boat use.) The only metal penetrating the Camano hull is the Aquamet 22 propeller shaft—and it is bonded, Miller says. Fuel tanks are welded aluminum, and the water tanks are made of roto-molded plastic. Three Vetus plastic seawater strainers—for the engine, generator, and watermaker—are mounted beneath a step that folds up for service access to the strainers. The strainers are bolted to the bulkhead between three braces that support the step, and Miller expects the strainers wouldn’t budge if stepped on accidentally. He says, however, that he will modify the step so that it always will return to the down position after the strainers are serviced. On the port side are three polyethylene boxes containing 6-volt, golf cart-type batteries for house circuits. The boxes, made by Blue Sea, are lag-screwed into stringers through restraining tabs molded on the lower outside corner of each box. Two battery boxes (for 12- and 24-volt service) are similarly mounted on the starboard side. The Blue Sea boxes contain reservoirs to contain leaking electrolytes—these batteries won’t stand in puddles of acid. I was about to note aloud that there was no drip pan beneath the engine, but Miller spoke first. A separate pan—which I believe is absolutely essential, but which many builders ignore—was not added, he explains, because any engine oil or coolant will drip into the hollow, deep keel. A dam in the keel below the aft end of the engine will contain engine goop, keeping it out of the bilge and from being pumped overboard. Marine-rated dual Racor filters are mounted on panels on the starboard side, with fuel-management manifolds. A fuel-polishing system is to port. Something else we look for in an engine room is battery-disconnect switches. They shouldn’t be there. And on the Camano 41 they are in the saloon, easily reached in an emergency. Camano builds its boats at Delta, a few miles south of Vancouver in an industrial area on the Fraser River delta. I stopped in on my way home to check out the production line. On my first visit, about six years ago, three of the 31-footers were under construction in what seemed to be a cavernous hall. This time, four of the new 41s were being built, along with several 31s, and the place was jammed with boats, workers, and equipment. So far, Camano has built 260 of the 31s. The newest was waiting for a truck to haul it to Florida. I climbed a ladder and looked into the finished hull of a 41 and decided it would be possible to float a 31 in there. With development of the 41, Camano began using a molded grid that fits deeply and precisely into the hull. It strengthens the hull and allows accurate placement of the engine, bulkheads, and other components. Camano hulls are solid fiberglass below the waterline; the builder uses bi- and tri-axial fabrics and treats the outer layers with vinylester compounds to reduce the chances of osmotic blistering. The topsides (from the waterline to the deck line) are cored with closed-cell foam, and the decks are cored with balsa for stiffness and insulation. Carbon fiber reinforces stress areas. At points where fixtures are attached to the deck, Camano installs a large block of foam coring to reduce the possibility of water intrusion. Cleats are through-bolted, with aluminum backing plates. The hull and deck sections come together in a shoebox-type joint, which is joined with fiberglass and screws. Many builders use vacuum bagging to build fiberglass components. Camano does not. Instead, workers apply resin to fiber with vibrating rollers, a process Miller believes provides excellent saturation and reduces the likelihood of voids in the finished product. One sign that the 41 is here to stay: Some of the interior components, which were changed several times early in production of the first few hulls, were built with temporary molds. I saw craftsmen at work manufacturing permanent molds for those parts. Once Camano recovers from the initial excitement and chaos that go with launching a new boat, it hopes to build about 10 of the 41s a year, Miller says. One hull was nearly ready for installation of the deck during my inspection tour. The view of the open hull, loaded with mechanical gear, tanks, water and fuel lines, and electrical systems, offered a valuable insight into boat construction. An advantage of buying a boat built in North America is that multiple visits during construction are possible. A worker told me that a buyer came recently with a digital camera and took dozens of photos of areas that would be out of sight when the yacht is complete. A good idea, for sure. Clearly, Camano met both goals. It has built a comfortable yacht, one that skippers and spouses should applaud—without hampering its ability to go to sea safely and efficiently. While working on this review, I bumped into a representative of a competing boatbuilder in a city where neither of us lives. He had been aboard the Camano 41, said he liked it, and predicted his company might lose some sales to the Canadian builder. Competition is extreme in today’s boating market. And that’s good for us, because it means boats are better. During a boat show on Seattle’s Lake Union in January 2004, Miller invited some of us from PassageMaker to an after-hours visit in the office of Dave Formo, Camano’s Seattle dealer. Laurene and Bill Parlatore were there, as were my wife, Polly, and I, and Steve D’Antonio, the magazine’s technical editor. It was raining hard and dark outside and all show patrons had gone. Only an occasional security officer walked by. It was a secret meeting, or at least hush-hush. Miller unrolled a bundle of drawings to reveal first concepts for a new Camano—the 41. He asked us for a critique. He got it. Which way should doors swing? Should the head be split? How do we arrange the galley? Where do we install the washer/dryer? I’m not sure any of us agreed. Polly, particularly, campaigned for a galley that would really work for a chef on a long cruise. A key requirement: a place to store larger utensils and other galley stuff. Miller and Formo took notes and penciled lines on the pages of drawings. After an hour or so, the meeting ended, and the two from Camano went somewhere to discuss the value of our comments. It had been fun, and I promptly forgot about it until my tour of the Camano 41 in Vancouver. Miller, standing in the galley, pointed to large drawers in the galley. “This is what Polly wanted,” he tells me. So, our fingerprints are on this boat. And I like that.